In 1949, Honda had only been established for two years, yet it already had three models in its catalogue: little workaday two-strokes which were badly needed in postwar Japan. But the company had wider ambitions. The resulting type D lived up to the hopes of its builder and was instantly given the name "Dream." Modern – for a Japanese Bike! While the Dream certainly represented a considerable advance over the other Japanese bikes of the period, it was strongly reminiscent of the Zündapp and Gnome & Rhone machines of the Thirties with its pressed steel frame devoid of rear suspension. 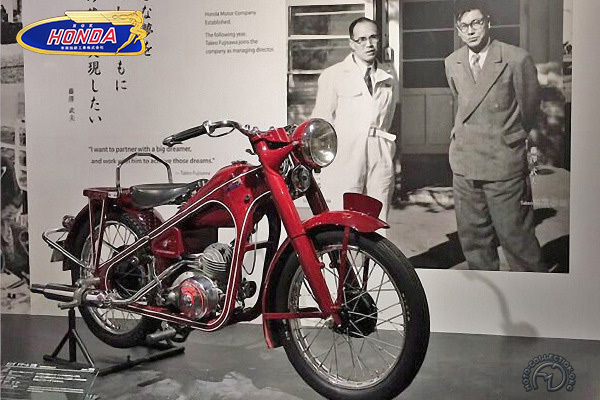 The type D was nevertheless an instant success, placing Honda in the first rank of Japanese constructors: in 1950, it built 1000 out of a total of 2633 motorcycles produced in the country. In grateful remembrance, Honda would baptize several subsequent models "Dream." However, the Dream's success caused the small-town Honda company its first growing pains, for at that time its distribution network consisted mainly of bicycle shops. By rapidly signing up the Fujisawa factoring company, by moving its commercial and industrial base to Tokyo, by rapidly creating a four-stroke model – the Type E – Honda quickly got back on target and the international career of the marque was off to a flying start. Honda's first real motorcycle was still only a two-stroke single with, as its sole novelties, the crankcase induction system and the rear-facing exhaust port.